Ross Castle is one of the most famous landmarks of Killarney National Park and it continues to attract thousands of visitors every year. On Ross Island, just over 2km from Ross Castle, is Library Point, a limestone rock formation on the shores of Lough Leane. The beautiful trail that leads out to Library Point is an idyllic journey through woodland tracks and lakeshore paths. Step out of the shadows of Ross Castle and discover a secluded and peaceful peninsula trail. Ross Castle and the surrounding area is one of the most frequently visited parts of Killarney National Park for many reasons. The castle itself is believed to have been originally built in the late 15th century. The main tower house is well preserved as are some of the circular towers of the surrounding keep. The castle is situated at a beautiful location on the eastern shores of Lough Leane, the largest of Killarney’s three lakes. With the McGillycuddy Reeks rising in the background from the far shore of the lake, a visit to the castle grounds remains one of the most popular activities in Killarney for visitors and locals alike. From the months of April to October, the castle itself is open to visitors where guided tours are conducted. Ross Castle is also a great place to set off on a boat trip on the Lakes of Killarney. Whether you are relaxing on a lake cruise, rowing or kayaking on your own steam or heading out in the traditional boats, this is one of the best places to start your journey from. Another reason for the popularity of Ross Castle is its close proximity to Killarney town. It is no surprise therefore, that the Castle and its environs feature high on many people’s ‘must see’ list of places to go in Killarney. Run Town Centre Via Knockreer and Killarney National Park 3.5 km flat paved surfaces throughout. Option to extend to 5km by including lakeshore loop. There is ample parking at Ross Castle and plenty of places to securely lock your bicycle around the castle grounds. During the summer months a coffee shop serves refreshments at the house adjacent to the castle, Public toilets are located to the rear of the castle. What many people don’t realise is that the adjacent Ross Island is packed with beautiful tracks and trails, viewing points, secluded bays and historical points of interest. Ross Island is separated from the mainland by a small channel that passes under the bridge that you cross to get to Ross Castle. Around the castle grounds you wouldn’t even know that you are on an island. Only in times of flooding is a boat required to gain access so don’t be put off by fact that it is an island! The paths on the island do not allow motor vehicles so it is an ideal place for a stroll, hike or jog. Bicycles and buggies are well suited to most of the paved paths. There are some minor hilly sections but none are too taxing. Parts of the island trails are woodland tracks in places so sturdy wheels will be required when leaving the paved paths. Take it easy going downhill as you could meet a walker, jogger or a four legged friend around the next bend. I had a close encounter with a stoat near the Copper Mines one morning that tested my brakes! Each of these has a number of extensions and variations if you wish to explore a bit further. It is possible to combine all three as well. All trails are well signposted with distance markers and information panels at key points along the trails. An accompanying guide booklet is available at Ross Castle but the booklet is not essential so don’t worry if you don’t have a copy with you. The trail to Library Point is just over 2 km from Ross Castle via the most direct route. It can be extended to a nice 5km return trip by including the Copper Mines loop on either the outward or return leg. At Library Point itself, there is a short loop around the headland of the peninsula which will add some distance. This optional loop is well worth the short detour as it skirts along some woodland paths high above the lakeshore below. Start the trail at Ross Castle near an old mining cart at the rear of the castle. Follow the path along and you will shortly see the derelict Ross Cottage on your left hand side. The poet Percy Shelley spent some time here in the 1860s. The path rolls along and you will shortly pass a gap in the trees where you catch your first glimpse of Lough Leane. At the far side of the lake, Torc & Mangerton mountains rise up from the lakeshore. You will soon reach the first signposted junction. Turn right here to head for Library Point & The Governor’s Rock. The path rises up slightly as we head into the heart of Ross Island through some magnificent woodland. The meandering trail rolls down again to a bend in the path where we turn off right towards Library Point. From here it is about 1km to Library Point as we leave the woodland to emerge into lower ground with marsh either side of the trail. In winter time and after heavy rains, this section of the trail is often flooded so prepare to have to turn back a little bit earlier than you planned! Leaving the boggy ground behind, you will shortly return back into the woods again. The lakeshore opens up at secluded bays along this stretch with wonderful views of the McGillycuddy Reeks across Lough Leane. There are many fine viewing points throughout the trail with contrasting landscapes and aspects. This makes the Library Point trail an ideal location for photographers to get some great shots. Soon you will notice the lakeshore appearing not too far from both sides of the path as you near the edge of the peninsula. You may spot a makeshift landing point at northern shore of the peninsula. Sometimes the rowing boats that depart from Ross Castle stop off here to land at Library Point for a picnic on a sunny day. It may not be possible to land here when the lake is high so check with the boatmen at Ross Castle before planning to reach Library Point by boat. Towards the end of the trail, you can wander around the pathways until you find a low fence towards the edge of the peninsula. This fence has been erected for safety purposes as the ground can be unstable underfoot here. Underneath this fence at the water’s edge is the rock formation known as Library Point. The limestone rock has been eroded to form a pattern that resembles books stacked on a shelf. From here, you can are looking out across to the nearby shores of Innisfallen Island. Behind the landing pier on Innisfallen, you will catch a glimpse of the 12th century ruins on the island. This is the closest point to Innisfallen from the mainland (even though Library Point is technically on an island..) The deer that inhabit the island often use this channel to swim back and forth across Lough Leane so keep your eyes peeled for any heads bobbing out of the water! You can return back to Ross Castle by retracing your steps on the path but there is a lovely trail around the head of the peninsula that is a nicer way to rejoin the main trail. This headland path is narrow and skirts some cliff edges on the western side so take care and watch your step. Returning to the main trail we will rejoin the original path that leads back to Ross Castle by cutting through the centre of the island. Watch out for a pathway to your left through the woods that is an alternative route back to the Castle. You will emerge at the rear of the castle where some boats are moored. If you stay on the main path, you will arrive back to your starting point at the old mining cart near the main car park. Despite being situated only minutes away from one of the busiest and most visited parts of Killarney National Park, Library Point is a world away from the hustle and bustle of the vibrant visitor hot spot that is Ross Castle. Emerging from the woodland of the peninsula on Ross Island, Library Point has a wonderful vista out to Innisfallen Island and the McGillycuddy Reeks beyond. The meandering paths through woodland and along the lakeshore to take you there make this one of my favourite trails of Killarney National Park. 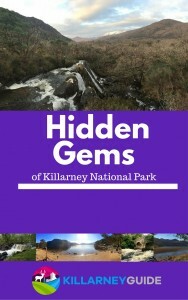 If you’ve enjoyed reading this post, please subscribe below to get a FREE eBook on Killarney National Park, and to get updates from Killarney Guide, please subscribe with your email below. Thanks for the comment Owen and delighted you enjoyed the Library Point trail. It is a fabulous place for a stroll, jog or cycle and you will have the place to yourself most times you go there!